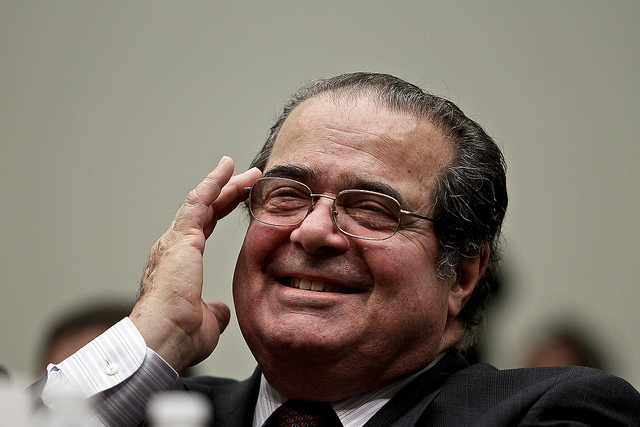 What does Justice Antonin Scalia’s Passing Mean for Immigration? When news broke of the passing of the longest serving Justice on the Supreme Court, Antonin Scalia, a cloud of uncertainty lifted above the heads of Republican frontrunners vying for the Republican nomination for President of the United States. Indeed, the topic of conversation during the February 13th Republican Presidential Debate, which occurred on the day of Justice Scalia’s passing, focused on whether or not the current President should nominate the next Supreme Court Justice. Justice Antonin Scalia, nominated to the Supreme Court by President Ronald Reagan in 1986, was the most outspoken conservative on the bench, and not very well liked by liberal politicians and intellectuals, primarily due to the philosophy behind his jurisprudence. Scalia’s jurisprudence during his 29 years on the bench belonged to the Originalist school of thought. An Originalist’s interpretation of the Constitution denies the contention that the Constitution should be interpreted by the Court as a living, breathing document, a view that is typically shared by liberal Constructivist Justices like Ruth Bader Ginsburg. Instead, Originalists believe that the Constitution should be interpreted according to the original intent or meaning shared by the founders as it was written. This would require an Originalist to adhere to the spirit of the law as it was intended by the founders of our country, as well as an understanding of what was meant when the Constitution was originally drafted. During his time on the bench, Scalia tenaciously criticized the liberal Constructivist view, calling this interpretation of the Constitution, judicial activism, which he viewed as inappropriate. In his view the Supreme Court must be insulated and not be swayed by the social concerns of the public. Throughout his trajectory, Scalia has gone down in history for handing down the most controversial dissents in the history of the Supreme Court, avidly supporting the right to bear arms, challenging the right to abortion, affirmative action, gay rights, and was ultimately instrumental in securing the Presidential nomination of George W. Bush in the 2000 case Bush V. Gore. Up until his untimely death, the Supreme Court held a conservative majority. The conservatives on the bench include Chief Justice, John G. Roberts Jr. nominated by President George W. Bush in 2005, Justice Clarence Thomas nominated by President George W. Bush in 1991, Justice Samuel Anthony Alito Jr nominated by President George W. Bush in 2006, Justice Anthony Kennedy, a moderate conservative swing vote nominated by President Ronald Reagan in 1988, and up until recently Antonin Scalia nominated by Ronald Reagan in 1986. Together, these conservative Justices established a 5-4 majority against liberal Justices: Ruth Bader Ginsburg, Stephen G. Breyer, and recently appointed Justices Elena Kagan and Sonia Sotomayor. Justice Antonin Scalia’s sudden death has now upset the conservative majority, creating a balance of power between conservative and liberal minds on the bench. With the death of Scalia, the bench is now evenly split ideologically 4-4 with a vacant seat ready to be filled by a liberal Justice, thereby creating a Liberal majority. This of course will not be easy, since the Senate is dominated by the Republican party, and the Senate will be in charge of vetting the President’s nominee. This disruption in the balance of power is transformative, since the court will likely continue to err toward the Liberal spectrum if a Democrat is elected in 2016. Of course, a Liberal Court will be more likely to be supportive of immigration reform and President Obama’s executive actions on immigration. Articles 2 and 3 of the United States Constitution establish the power of the Supreme Court and the power vested in the executive to nominate Justices to the Supreme Court. 28 U. S. C. §1 states that the Supreme Court shall consist of one Chief Justice and such number of Associate Justices as deemed appropriate by Congress. The current number of Associate Justices is eight. Only the President may nominate Justices to the Supreme Court, however appointments must be made according to the advice and consent of the United States Senate, currently dominated by the Republican party. Throughout history, Presidents have overwhelmingly nominated Justices to the Supreme Court who share the same political affiliation, values, and ideologies. Though the process of nominating and appointing a Justice is extremely political, the Constitution allows this process to occur, through a system of checks and balances. The nominee will undergo extensive vetting before the Republican led Senate. Nominees are heavily scrutinized by the opposing party on the ideological spectrum, despite having been nominated by a President sharing their political and ideological convictions. This process establishes an intrinsic system of checks and balances. It is clear that the Republicans in the Senate will not go down without a fight, making the appointment of the next Supreme Court Justice all the more political. Although the Republican frontrunners for the Republican Nomination have argued that the next President should nominate the next Justice to occupy Justice Antonin Scalia’s vacant seat, it is within President Obama’s power to nominate the next Justice to the Supreme Court. In fact, President Obama has declared that it is his intention to nominate the next Supreme Court Justice before his exit from the White House. President Obama has already nominated two liberal justices to the court including Justice’s Sonia Sotomayor and Elena Kagan. It is certain that the next Justice will also share his Liberal values, giving Obama the Liberal majority he desperately needs in the Supreme Court, in order to pass his expanded Deferred Action for Childhood Arrivals (DACA) program and new Deferred Action for Parents of Americans and Lawful Permanent Residents (DAPA) program. However, President Obama must choose his nominee very carefully. If he nominates a Justice that is too liberal, the nominee will likely not make it past the Republicans in the Senate. The nominee must be someone that is well respected by Republicans and Democrats alike. President Obama must also be careful not to nominate a moderate Justice to the Supreme Court, which may tip the balance in favor of the historical conservatives on the bench. A vote from conservative moderate Justice Anthony Kennedy, will also be instrumental in deciding whether the federal government will be able to overturn Texas in favor of Obama’s DACA/DAPA programs on appeal. To establish a legal precedent, the federal government would need at least 5 votes in favor of these programs. It is indeed unfortunate that Justice Scalia’s passing has become politicized due to the simple fact that it occurred during an election year. Nevertheless, it will be interesting to know who President Obama will nominate, and how the nomination will play out in the months to come. The Supreme Court is expected to rule on expanded DACA and DAPA before June of this year. The Supreme Court has already heard several cases alongside Justice Antonin Scalia concerning voting rights, affirmative action, and labor unions, but has yet to publish an official ruling. The Supreme Court is expected to hear arguments for abortion, contraception, and immigration in the Spring. For more on these cases please click here.